The meat supplied by OK Foods is the same quality sold to the restaurants, Kupchick said. OK Foods gave the food bank its choice of meats to pick from, he added. Clemons requested individual bags with two chickens cut into quarters for distribution to families in need. Previously, the chicken meat was received in large cardboard boxes, mostly with leg quarters frozen together. This new method of distribution to the food bank, with two chickens in vacuum-sealed wraps, is also an effort to encourage family meals at the dinner table, Kupchick said. It is the food bank’s goal to encourage more home-cooked meals, bringing families together for discussions with a chain reaction of accountability to their family and their community, he added. The cooked portion of OK Foods’ donation Tuesday was breaded nuggets of boneless wing and breast meat. The River Valley Regional Food Bank serves Crawford, Franklin, Johnson, Logan, Polk, Scott, Sebastian and Yell counties through a network of 189 member agencies. “In an area where just over 300,000 live, there are over 53,000 classified as food insecure and the food insecure include 25,000 children,” Kupchick said. Many of those in need are are also elderly and disabled, he added. 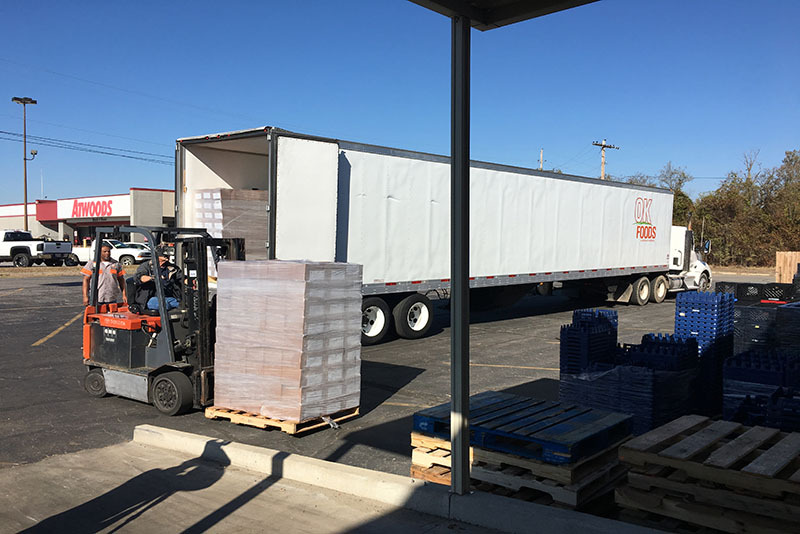 OK Foods has donated to the food bank in years past, but the new pledge of 100,000 pounds a year far surpasses their previous donations, Kupchick noted.